Refurbished! Tested and Wiped! 30-Day Money Back Guarantee! 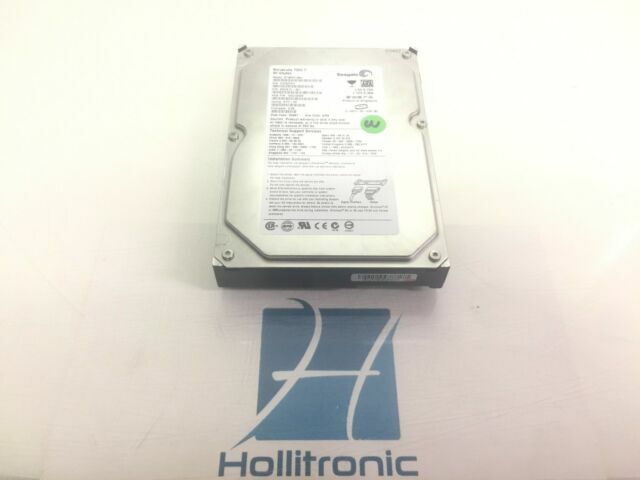 item 7 Seagate ST380013AS 9W2812-301 80GB SATA Hard Drive, Fully Tested! -Seagate ST380013AS 9W2812-301 80GB SATA Hard Drive, Fully Tested! Like its ocean-going namesake, the Seagate Barracuda ST380013AS 80GB hard drive is a lightning fast addition to a system. It is sized to serve as an extension to existing storage or a backup drive for important files and software. This Seagate SATA hard disk provides reliability and exciting proprietary features. The Seagate Barracuda hard drive brings power and versatility to a build. It is also an effective replacement for an older drive on a laptop or desktop. Designed to be easy to install, format, and use, it is a solid type of 80GB SATA HDD. The ST380013AS hard drive sports an 8MB cache for quick and efficient transfers to and from memory. This helps to reduce your wait time when using your favorite apps. This hefty cache is combined with the Barracuda's industry standard 7200-RPM disk speed. It results in a very fast 4.16 ms average latency. In daily use, the ST380013AS accessories can reach external transfer speeds of 150MBps and internal speeds of 85.38Mbps. This is sufficient to use in many demanding applications. The spindle, read head, and plate itself are all manufactured to high-quality specifications. This ensures that, even at this speed, your data gets where it needs to go safely. This attention to detail has been demonstrated by the reliability of these drives over long-term and daily use.This drive has a 3.5-inch form factor, the most common in modern desktop computers. This makes it a good base to build or refurbish a computer on. These are designed for use as internal drives inside a variety of towers. They have a bare disk enclosure with sturdy aluminum frames. Furthermore, this hard drive uses an IDE Ultra ATA100 and SATA interface. That gives it wide compatibility across many types of computer systems. Installation is easy with the simple and robust SATA connectors that ensure that it remains secure inside your tower.The 80GB of space is perfect for a variety of uses by consumers or industry professionals. This is sufficient to hold thousands of photos, dozens of videos, and hours of raw footage. These drives not only store memories by the hundred, but they also serve as effective backups. They can store a variety of types of data on your system. Recognizing the utility as a backup device, Seagate has designed this drive to serve as a reliable long-term method of storage on your system. This provides safety and peace of mind for the user.For the home user who wishes to store their favorite photos or videos, the easy installation is helpful. When used at the office to store important documents and presentations, the Barracuda’s security features are important. The Seagate Barracuda ST380013AS has a proprietary design intended to protect against drive tampering or scraping. This 3D defense system protects your sensitive data against external intrusion. Hard drive defense extends far beyond internal issues, however. Recognizing this, the Barracuda also utilizes precision engineering to protect the drive's contents from up to a 350-g shock. This means that the device can easily survive bumping and dropping. This product fit my computer well, everything was fine until I turned it on. It came with the operating system called LINUX. I never heard of this system before. I was expecting the hard drive to be BLANK so I could install the operating system of my choice. It seems to be permanently installed and I could not over ride it to install WINDOWS 7. I have no choice but to use LINUX as the operating system. great product, use caution buying refurbished or used. Ii would recomended as a good buy. The Seagate SATA drive with it s 8 meg cache and high transfer rates make it a very good drive. I have had all the other major brand names and some that were not and this is my most dependable drive. Have the standard IDE also. It would be perfect if the SATA drives could be mirrored off your original, but that is my only complaint. It is a SATA problem, not Seagate. I would recommend it for a raid 0 solution personally. I bought this hard drive because I wanted the faster response time with the 7200 RPM disk speed. I probably would have gone with a larger capacity but the price was right and didn't really need the extra capacity. Overall, I'm satisfied with the hard drive. Works Great. . . doubled my capacity on my old computer at a price that was unbeatable. Runs quietly and was easy to install. My old HD was nearly full making my computer operate slow, this drive solved my problems and it runs like it did when it was new. I highly recommend this drive weather as a main drive or a slave for storage.